A former Liberal justice minister accused China of using "hostage diplomacy" because of its death penalty sentence of one Canadian man, the imprisonment of two more and the harassment of a Montreal woman and her infant daughter in Beijing. Irwin Cotler, the founder of the Raoul Wallenberg Centre for Human Rights, took China to task for characterizing Canada's arrest of Huawei executive Meng Wanzhou on Dec. 1 in Vancouver at the request of the U.S. as "vile, unconscionable and evil." 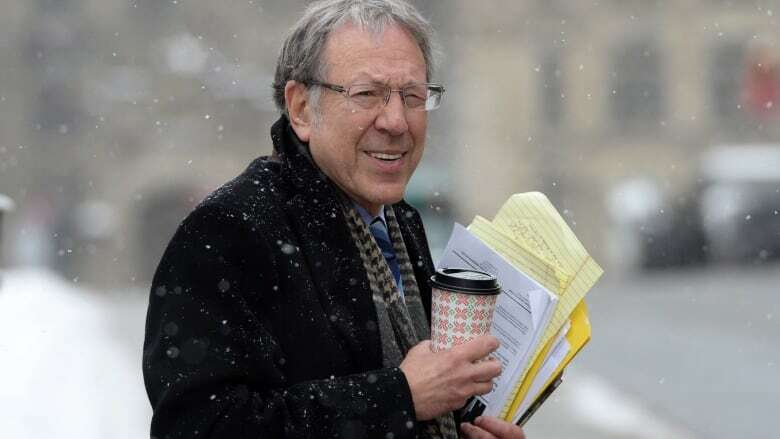 "These words define and describe China's hostage diplomacy ever since — including its detention of Canadians Michael Kovrig and Michael Spavor and the arbitrarily cruel death sentence of Robert Schellenberg," Cotler said in an email to The Canadian Press. China detained Kovrig, a Canadian diplomat on leave, and Spavor, an entrepreneur, last month on vague allegations of "engaging in activities that endanger the national security." Western analysts believe their arrests are an attempt to pressure Canada to release Huawei executive Meng. "But nothing exposes and unmasks China's contempt for the rule of law, in China as well as in Canada, and its own 'vile, unconscionable and evil' conduct than its cruel and inhumane treatment of Ti-Anna Wang and her infant daughter," Cotler said. Last week, Wang arrived in southern China where her father, Wang Bingzhang — considered to be the father of China's ill-fated international pro-democracy movement — has been jailed since Chinese agents snatched him in Vietnam in 2002 and hauled him back to the People's Republic. China has consistently denied Wang's attempts to visit her father for almost a decade, as his health has been declining. In August, Wang was given a fresh Chinese visa, but when she arrived in southern China last week with her husband and 11-month-old daughter, she was turned away after a six-hour airport ordeal. She was sent back to South Korea, where she had been visiting her husband's family. On Wednesday, as she and her family were changing flights in Beijing on their return trip to Canada, Wang said half a dozen Chinese agents boarded her flight, took her and her daughter into custody, and separated them from her husband. Two hours later they were forced onto a different flight and sent back to South Korea. Wang's family had to rebook their travel back to Montreal on a new flight from South Korea that took them through the United States. "Unlike last time, no questions were asked. I wasn't allowed to use my phone or computer, or contact the Canadian Embassy. I couldn't consult with my husband, whom I didn't see again until we were being escorted to the gate, or contact Air Canada to rebook my flight," Wang said in an email from South Korea. "It was a shocking, terrifying and senseless ordeal with no purpose but to bully, punish and intimidate me and my family," she wrote. Canada's foreign ministry had no comment on Wang's treatment by Chinese authorities. But the two countries continued to trade barbs Thursday over the detentions of Kovrig and Spavor and the death sentence to Schellenberg. Chinese foreign ministry spokeswoman Hua Chunying said Thursday that people from China could themselves be at risk following Canada's detention of a Chinese telecom executive for "no reason." "What threat has China posed to Canada?" Chunying said when asked by journalists about the duelling allegations. "I think your foreign minister may be in a hurry, and can't help speaking without thinking." The remark was triggered by Foreign Minister Chrystia Freeland's comment Wednesday that "the arbitrary detentions of Canadians ... represent a way of behaving which is a threat to all countries." The death sentence has also been fuelling a daily sparring match between the two countries. "It is understandable that Canada is a little worried, but we hope it will avoid speaking freely without thinking because its reputation and image would be badly damaged by such behaviours," Hua said Thursday. "And such remarks cannot help settle the issue, either." John McCallum, Canada's ambassador to Beijing, is scheduled to appear before an all-party parliamentary committee for one hour Friday morning to field questions from MPs about the situation involving the three Canadians in China. The meeting will take place behind closed doors. McCallum told reporters late Wednesday that two Canadians detained last month in China are being interrogated by authorities for up to four hours a day. Speaking at a three-day cabinet retreat in Sherbrooke, Que., he also credited the government's efforts to get allies to rally in support of Canada's position. "I really think that's just the beginning," he said. "I think we have to engage the senior Chinese leaders and persuade them that what they are doing is not good for China's image in the world, it's not good for the image of corporate China in the world."